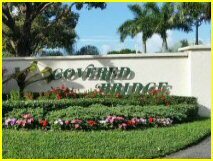 This website is a resource for owners and residents of the Covered Bridge Condo Association. Here you'll find documents, forms, meeting minutes, financial reports, club info, links to Palm Beach County and State of FL websites, etc. Current and past Newsletters from your Board and Property Management Team are now available under the "NOTICES" heading above. Please relay requests for new features to our property manager - by email, coveredbridgeoffice@comcast.net. PLEASE NOTE: To submit a work order, click here. Copyright© 2015-2019 by Covered Bridge Condominium Association, Inc. Structure by FWT. Photos by Beverly Hoff. Website implemented by BridgeSights.